Parental theory has undergone a paradigmatic shift in the last half century or so. Older baby-boomers in particular bear witness to the wide pendulum swing in our society’s prevailing opinion concerning acceptable parental expectations for children. Older Americans remember maxims of the bygone era to the effect that children were “to be seen and not heard,” and were “not to speak [to an adult] unless spoken to,” and then only with deference and respect. In stark contrast, the prevailing persuasion of our times is that children are to speak whenever they wish, and to say just about whatever they want, whenever they choose to say it. Some will remember a day when calling one’s parents by their first names was to risk great bodily harm. I remember the braggadocio of the bravest rebels of my peer group who dared, in a moment of unbridled irreverence, to launch such a sortie against parental authority. But today, increasing numbers of parents invite such first-name familiarity as an expression of their freedom from the dictates of authoritarianism. In the older era, parents tended to unabashedly make decisions for their children. They set firm rules and enforced them—often harshly by today’s standards. They regularly told their children “No,” and suffered little embarrassment from doing so. With rare exception, parents are not wound nearly so tight these days. The prevailing culture encourages parents to regularly defer to their children’s opinion, to withhold as little as possible, to keep rules to a scant minimum, and to specialize in overlooking or downplaying infractions. Children may be taught good manners, but only by way of gentle suggestion. Parents have generally evolved past the primitive days of asserting and enforcing strict standards of behavior for their children. A statistical report in a secular parenting magazine recently claimed that the vast majority of American parents spank their children to enforce obedience. But from the cultural chatter concerning all things parental, you would certainly not know it. “No,” is a most uncomely parental word these days and correction—particularly physical discipline—is virtually taboo. Non-directive self-esteem building, sprinkled with sizeable doses of self-effacing parental patience, is all the rage in parental practice. This paradigmatic shift has deep roots. Following World War II, social engineers redoubled efforts to eliminate deference to authoritarian structures and to democratize virtue. In other words, if good manners and virtuous behavior were widely held to obtain from a child’s nurture in authoritarian standards, children who lacked access to such nurture would be socially disadvantaged. The playing field could be leveled, however, by redefining virtue as that which naturally makes any particular child feel good. As an essential aspect of the sales pitch for this new paradigm, experts assured parents that children are naturally endowed with unlimited potential to self-actualize. Parents were thus assigned the new role of facilitating the free expression of their children’s natural instincts, feelings, and desires. Parents were to provide their children with safety, security, and friendship. They were no longer to view themselves as their children’s moral shepherds responsible for leading their progeny to the verdant pastures of conformity to any external standard of authority. We may rejoice that the harsh, stoical parenting style that sought to secure children’s obedience by intimidation and generous doses of false guilt has lost popularity. But is not the pendulum swing to the opposite extreme just as concerning? Are we all that better off to eschew compliance by means of fear when we default to compliance by means of bargaining, tricking, bribing, nagging, and manipulation—all of which are essential to non-directive, democratic methods of parenting? What do we think we have gained when children are left to talk out loud and walk the aisles during a wedding ceremony? What have we gained when children are permitted to ruin the dining experience of others by their unbridled freedom to “explore” a restaurant? 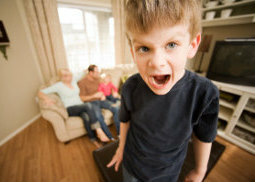 What have we gained by permitting children to be rude, self-centered, and obnoxious when relating to adults? Is it progress to see more and more children in our schools dominating the time and attention of their teachers because those students show little capacity to exercise self control and render appropriate respect toward others? The prevailing mentality seems to suggest that the new paradigm is worth all the pain. We just need to endure the immature behavior of our children until they blossom into maturity on their own. Kids will be kids, and they will grow up. Patience is the ticket. I will concede that abundant patience is a necessity for fruitful parenting and that unloving authoritarianism is no answer. Having said that, are we helping our children when we downplay parental authority and permit them to establish habits of unbridled, self-centered behavior? The answer hinges on whether there is a Creator God who has made us in His image. If God has indeed created us in His image, He is the ultimate authority, and conformity to His will is the ultimate source of purpose and joy for His creatures. To facilitate and promote this knowledge, the God of the Bible calls parents to submit to His authority and then to exercise derivative authority over their children. Parents are not free to exercise autonomous authority, as if children existed merely to please their parents. Rather, parents are moral shepherds called to nurture their children’s submission to God’s authoritative will as stewards of His grace (Eph. 6:1-4). As agents who willingly serve under God’s authority, parents are called to establish and enforce moral boundaries for their children. They are to teach their children to render honorable respect to all people as persons made in God’s image. They are to train their children to love others as they love themselves and to treat others as they would have others treat them. Parents are to discipline their children when they disregard authority. They are to actively resist their children’s innate self-centeredness, not encourage its expression. The only way for any of this to happen, of course, is for parents themselves to have been rescued from their innate self-centeredness and alienation from God (Luke 9:23-24). Only parents committed to the selfless path of personal discipline out of love for God and others will be morally equipped to faithfully discipline their children. Only parents who rejoice to live under the authority of God can effectively, and with integrity, establish and enforce moral parameters with their children. Parents who resist the authority of God in their own lives stand on treacherous ground when giving authoritative direction to their children. When dad runs red lights and calls in sick to work so he can catch up on house projects, or when mom slips something into her purse at the shopping mall and gossips about the neighbor, or if parents speak with contempt about the president and criticize teachers and coaches, the authoritative directives of such parents sound pathetic in the ears of their children and eventually embitter them. God designed us to live in submission to authority. The first arena in which this vital truth is learned is the home. As children learn a basic sense of submission to parental authority, they are equipped with a vital, moral skill that will contribute to their prosperity as human beings. When that skill is transferred from parents to God, children are on the path to joy—right where we should want them to be. I think Dan nails it here. Most of the change in parenting style is not really theologically driven but rather by the shift in our culture's view of authority. Parents are not free to exercise autonomous authority, as if children existed merely to please their parents. Rather, parents are moral shepherds called to nurture their children’s submission to God’s authoritative will as stewards of His grace (Eph. 6:1-4). i think this is a good paradigm. the rod is a metaphor of nuturing comfort (psalm 23:4), not just a harsh physical punishment. in related news, http://www.ajc.com/news/nation-world/police-handcuff-georgia-kindergartn... a tantrum-throwing 6yro had to be restrained by police with handcuffs . she's been suspended from school for the rest of the year and charged with simple battery and damage to property. In many discussions over the last few years about home education, an idea that is often proposed in protest is that requiring a child to do something they don't want to do is a violation of their civil rights. IOW, they should choose where they want to go to school, decide if they want to be religious, and which religion they will follow. They make it sound like the parents are there to provide a roof and fill the fridge. Otherwise, just stay out of the way and let the kid figure things out for themselves. They also go on and on (especially if you use the phrase 'my child') about how children aren't our property, but our responsibility. And yet parents don't have the authority to teach them or decide what it best. They much prefer the state decide with gov't regulations and oversight. Can I just say "Yikes"? Burdening children with adult-level "civil rights" is just cruelty. I don't doubt these folks mean well, but they seem to be completely ignoring the nature of a child: Not Grown Up Yet. Kids have neither the thinking skill, moral skill or necessary information to make these kinds of decisions. It's like taking someone to a roof, declaring that you believe he has the right to fly and pushing him off. My parents came from two different religious backgrounds, and decided to let us choose what we wanted to do. They never went to church, so neither did I. I went the way of the world untl a former college roommate was drawn to Christ and witnessed to me, demonstrating the II Corinthians 5:17 principle of a changed life. Leaving a child to make all his own choices is abandoning him to depravity. There are times we must let them choose, so they learn about consequences. Let me share an account from our daughter's chlidhood. She had beautiful, long blond hair. At about 10, she decided she wanted to have it all cut very short. We tried to persuade her to try it a little at a time but she insisted. She was not trying to be rebellious, she just wanted short hair. After she had it cut, she came home and went to her room. We assumed she was primping in front of her mirror, but she was crying because she hated it. She said that incident reminded her of the consequences of actions, and was used by the Lord to help her think ahead. We had no idea at the time how life strengthening this decision would be when we let her make that choice, but we knew it was not a choice that would harm her. In fact, the Lord used it to strengthen her. We are placed here by the Lord to give them guidance, direction, and correction. The goal is that our external guidance will be transferred to their internal guidance as they learn to walk with the Lord. The temptation is to not only protect from harm but protect from grief also... yet grief can be so educational!